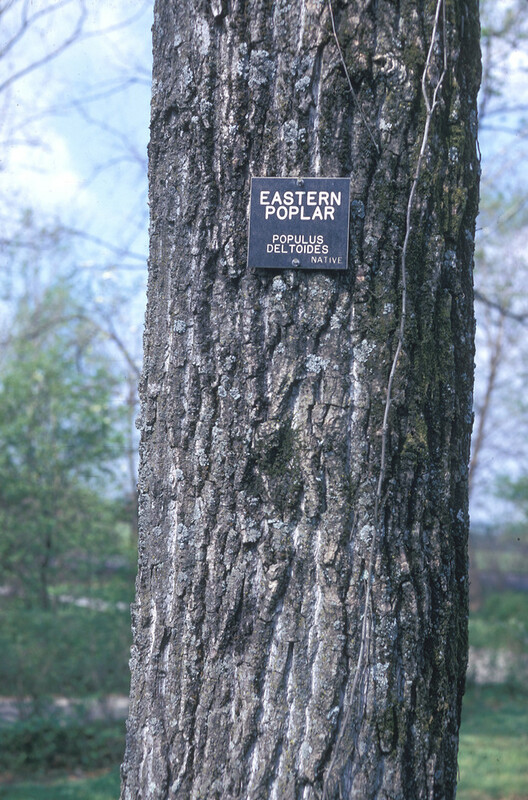 Though necklace poplar (also known as eastern cottonwood) is a short-lived tree, already old at age 75, it can grow to 100 feet (30m) or more in height in its native streamside habitats. 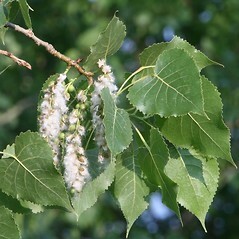 Cottonwood gets its common name from the wads of cotton surrounding its seeds, which facilitate dispersal by wind and water. 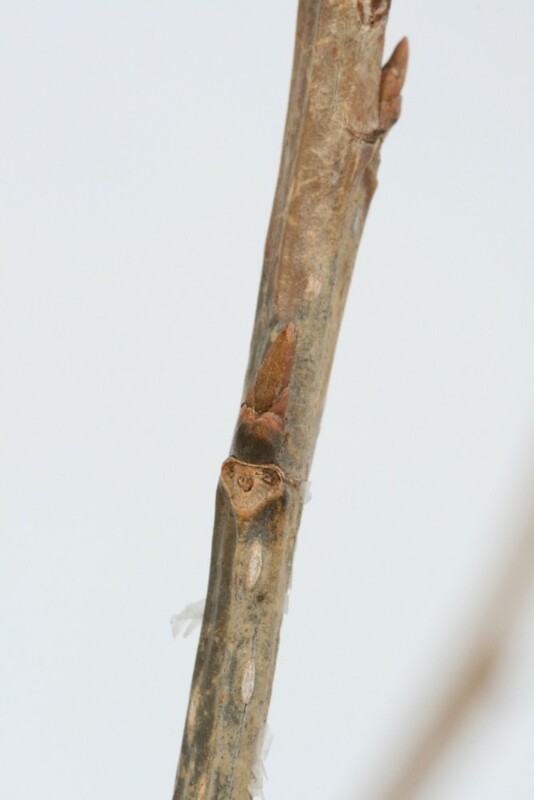 Look for snowstorms of this cotton in early June. 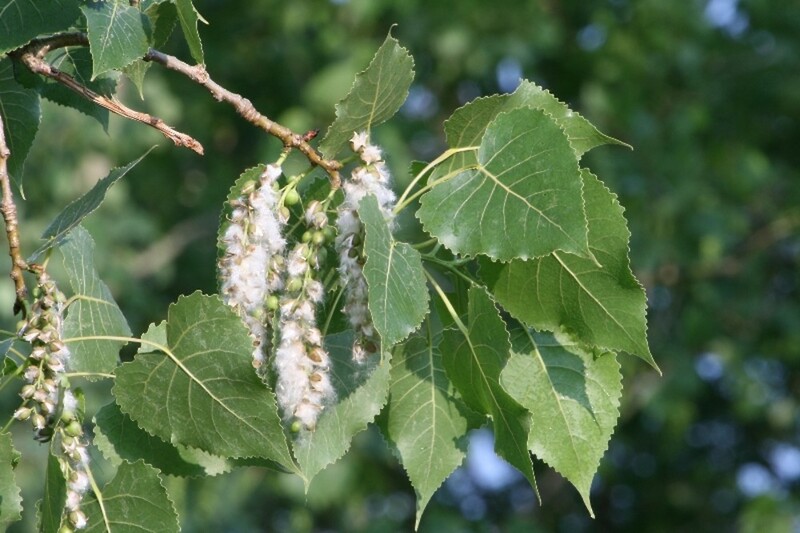 With its stabilizing roots, it is tolerant of stream and river floods, and is an important tree in maintaining the structure and function of floodplains. 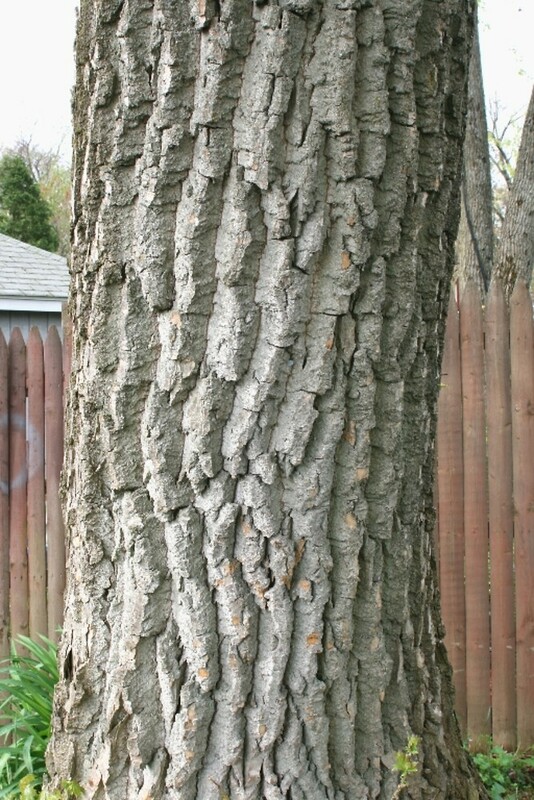 Although its wood is as stiff as white oak and yet light as white pine, it is under-used because it is susceptible to warping. 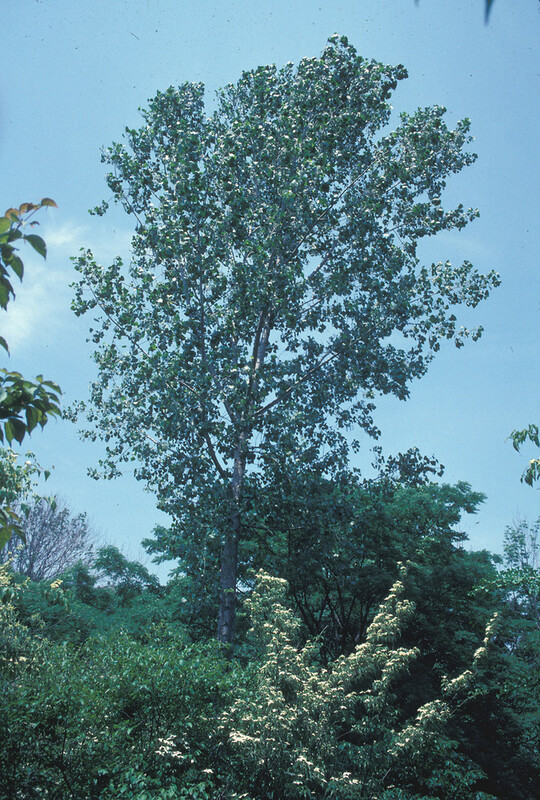 This rapidly-growing species is a convenient shade tree. 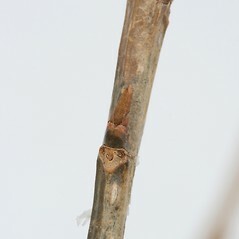 leaf blades on long shoots 5–10 cm long, eciliate, crenate-serrate with teeth ca. 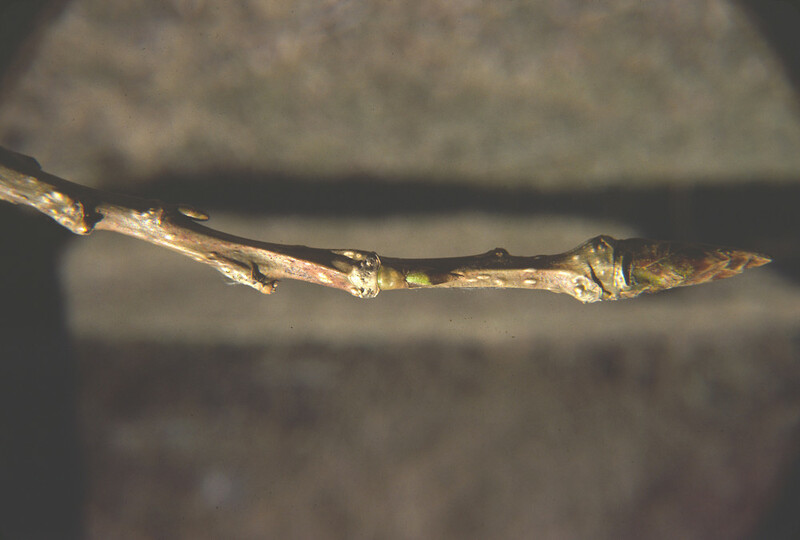 1 mm tall, and apex of petiole without glands (vs. P. deltoides, with leaf blades on long shoots 10–18 cm long, ciliate, serrate with teeth 2–5 mm tall, and apex of petiole with 2–5 glands). 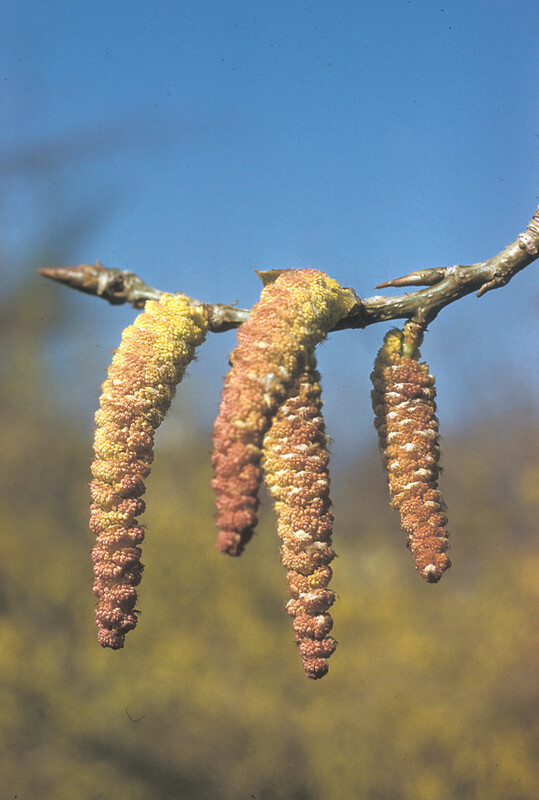 Populus balsamifera var. missouriensis (A. Henry) Rehd. 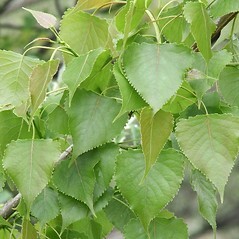 Populus deltoides var. angulata (Ait.) Sarg. 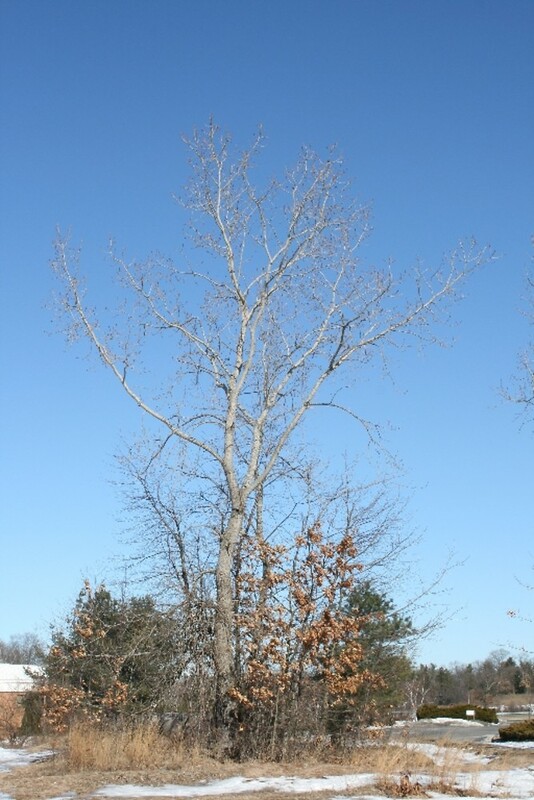 Our variety is Populus deltoides Bartr. 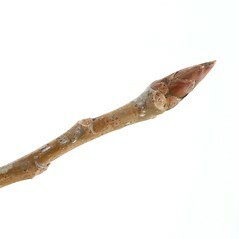 ex Marsh. var. deltoides. 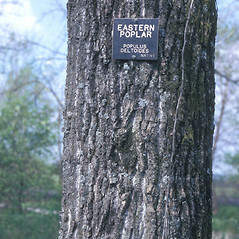 necklace poplar. 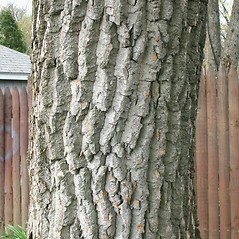 Populus angulata Ait. ; P. angulata Ait. var. 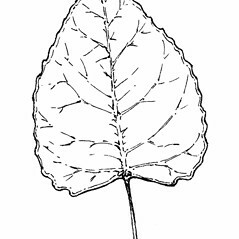 missouriensis A. Henry; P. balsamifera L. var. 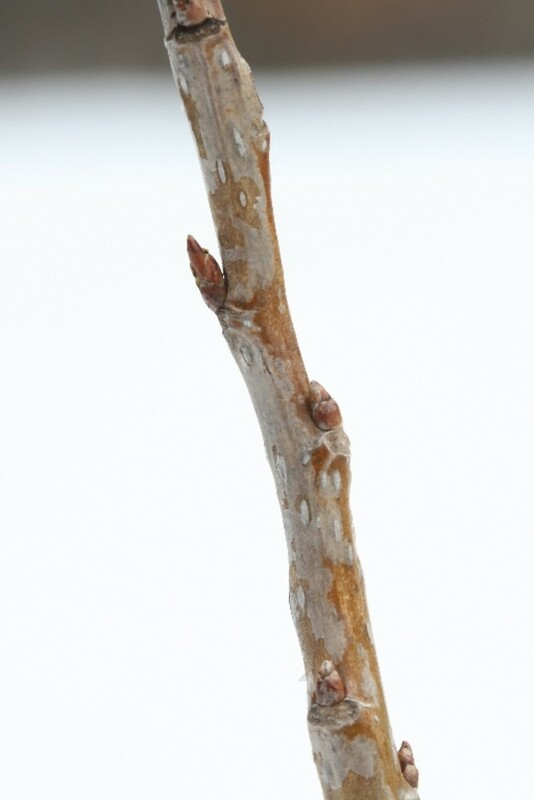 missouriensis (A. Henry) Rehd. 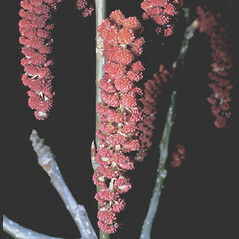 ; P. deltoides Bartr. ex Marsh. var. angulata (Ait.) Sarg. 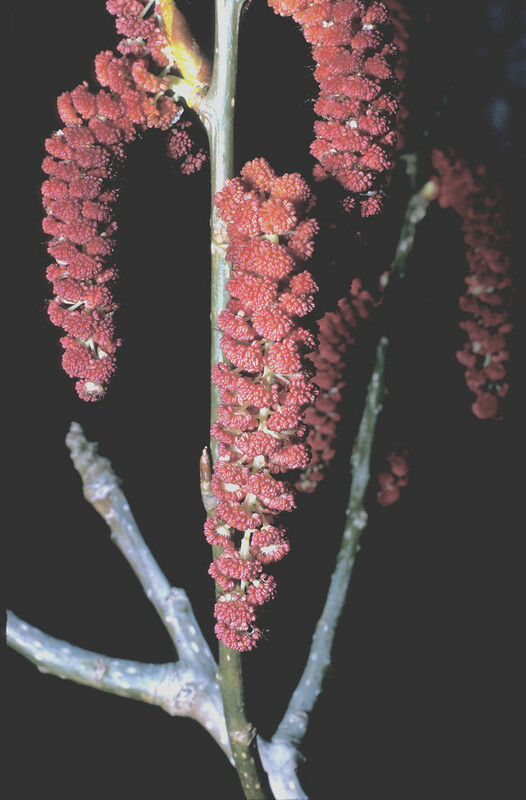 ; P. deltoides Bartr. 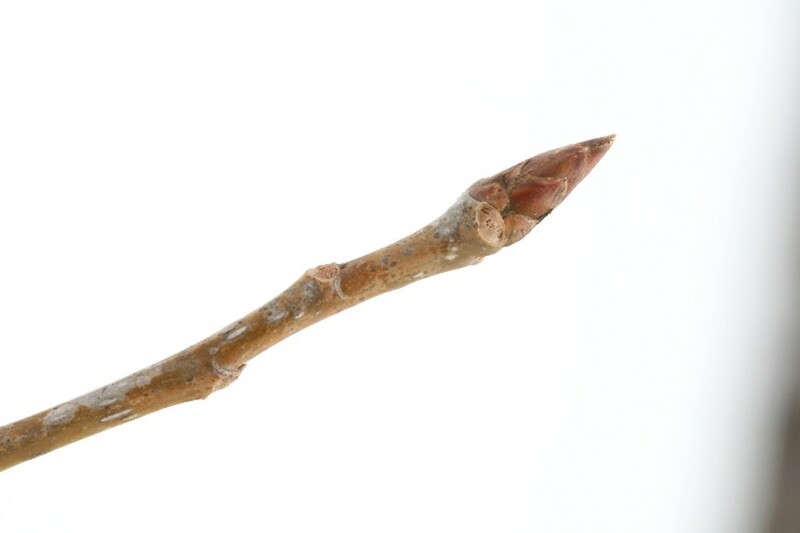 ex Marsh. var. 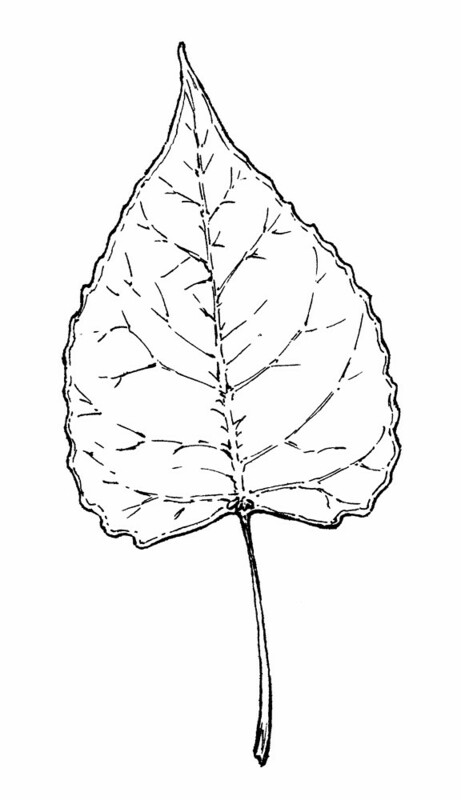 missouriensis (A. Henry) A. Henry; P. deltoides Bartr. 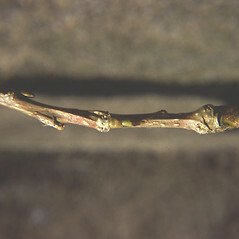 ex Marsh. var. 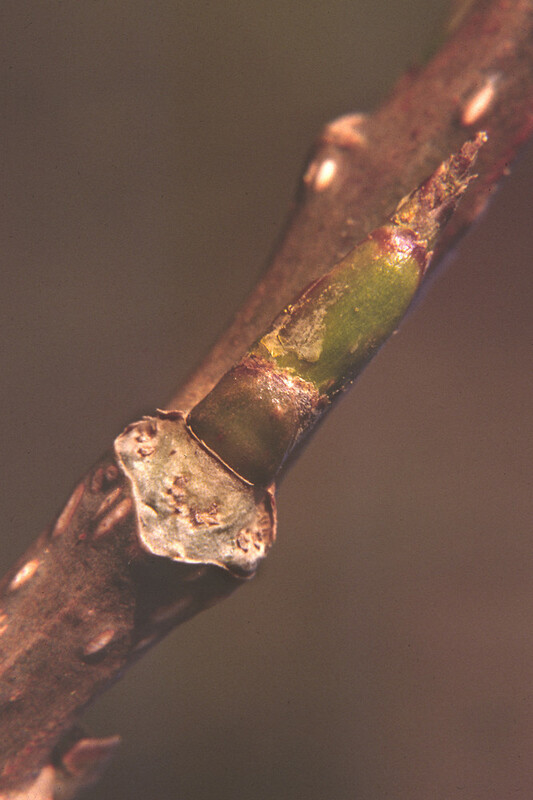 pilosa (Sarg.) Sudworth • CT, MA, ME, NH, RI, VT. River banks, riparian forests, lacustrine forests, roadsides, waste areas, about dwellings. 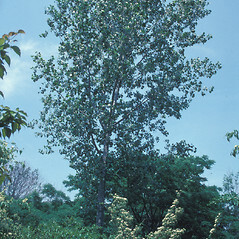 This species is non-native in ME and native, at least in part, to other states in New England. 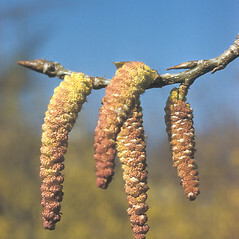 As a native, it appears usually on shorelines and riverbanks and in lacustrine and riparian floodplains. 2×3. 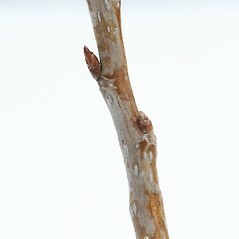 Populus balsamifera × Populus deltoides → Populus ×‌jackii Sarg. 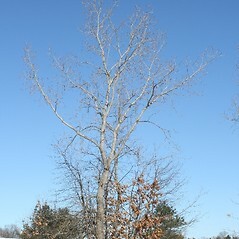 is an uncommon hybrid poplar that has escaped from cultivation in CT, MA, ME, NH, RI, VT. 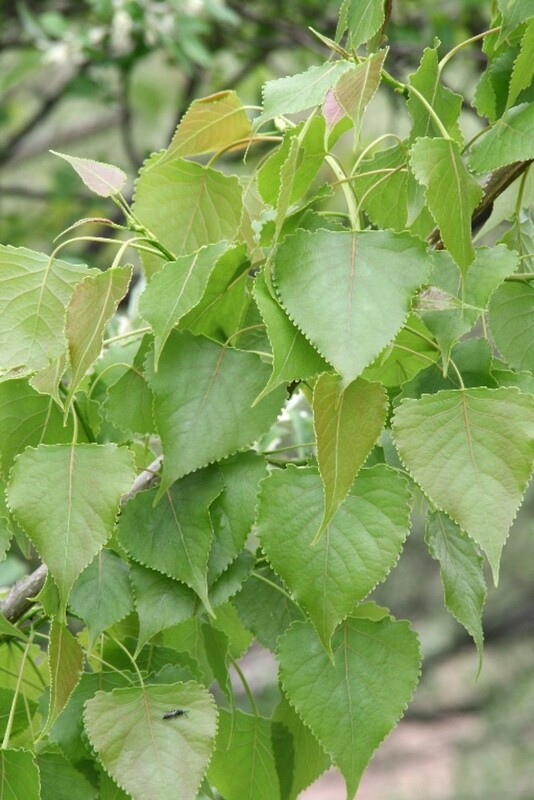 It has long been known by the name Populus ×‌gileadensis Rouleau. 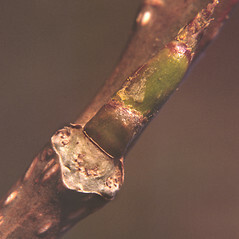 It can be recognized by its broad-ovate or triangular-ovate leaf blades that are acuminate at the apex and borne on weakly compressed petioles, visicid terminal winter buds, terete branchlets (rather than somewhat 4-angled in P. deltoides), staminate flowers with 25–40 stamens (rather than (30–) 40–80 stamens in P. deltoides), and 2- or 3-valved capsules with 7–14 (–20) seeds per placenta (rather than 2-valved capsules with 15–22 seeds per placenta in P. balsamifera).